Bashnag, an Orc conjurer, is the leader of the spellsword coven residing in Southfringe Sanctum. He cast Selveni Nethri out of his circle of mages, cursed and chased her into a spider web, giving you the opportunity to save her as part of a miscellaneous quest. He spends most, if not all, of his time at the arcane enchanter in the back of the dungeon. He always wears ancient Nord armor, but the rest of his equipment is leveled. His boots can be iron, steel cuffed from level 6, and steel plate from level 18 onward. 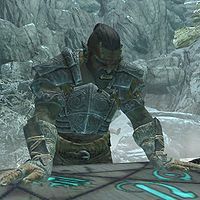 His gauntlets will always be enchanted with either Fortify Alchemy, Fortify Marksman, Fortify One-Handed, Fortify Smithing, or Fortify Two-Handed; and they can be iron, steel Nordic from level 7, Dwarven from level 13, steel plate from level 19, Orcish from level 26, ebony from level 33, dragonplate from level 41, and finally Daedric from level 49 onward. He also wears two pieces of unenchanted leveled jewelry, specifically a ring and an amulet. He wields a leveled mace, which can be iron, steel, Orcish from level 9, Dwarven from level 15, and elven from level 22 onward. He also carries a leveled staff, three random gems, and some gold. His spells are taken from the standard necromancer spell lists. Technically speaking, he is an unnamed necromancer that will respawn, but has been given the name Bashnag through the related quest. In addition to a name, he's also been given a copy of the Destruction skill book The Art of War Magic, and the Healing, Fast Healing, and Conjure Frost Atronach spells. This simply means that when he respawns, he'll have a generic necromancer name, without the book and extra spells. When you've freed Selveni, she'll thank you and explain how she got stuck in the first place: "Bashnag's coven chased me out and left me for dead down here. Nobody lasts too long with the spiders." If you inquire on the coven, she'll reveal: "Bashnag's circle of mages. We - well "they" live here. They made it pretty clear that I'm no longer welcome. ", and further inquiring will yield: "These are no dainty college mages. Bashnag has the skill of a magister and the mind of a warlord. This is a dangerous bunch. They're good company if you want to study necromancy in peace, though." When you ask her why she was cast out, she'll explain: "I left for a few days in Riften. When I came back Bashnag accused me of trying to sell him out to the Thalmor. I was cursed and chased off." If asked for the reason she went to Riften, she'll explain she was accused of illegal necromancy, causing her daughter to be sent to the orphanage, and will continue: "I joined with Bashnag then, but I thought of Savela every day. So I snuck off, hoping to find and steal away with her." When you ask if she can make it out of the cave, she'll admit: "Bashnag cursed me. I can't cast a spell to save my life right now. I'll have to wait until the way out is safe." While it is not necessary to kill Bashnag to aid Selveni's escape, you're able to inform her of his death: "He is? I'm not sure how to feel about that. Perhaps it's for the better." With Dragonborn installed, his equipment can also consist of Nordic material. He can be named generically as a necromancer instead of Bashnag when he is the target boss of a radiant quest. This page was last modified on 10 March 2014, at 14:17.